One morning last week I got home from a brisk walk around Dulwich, pleased to have done my daily exercise and ready to spend the rest of the day working. But I was straight back out of the door soon after turning on the computer and seeing that a local pub had tweeted a video clip of Shire horses ploughing in the park. It’s not something that happens often in the 21st century, certainly not 4-5 km from the centre of our capital city, so the shoes were back on and 20 minutes later I was in Brockwell Park. It turned out to be a perfect afternoon with clouds coming right out of a John Constable landscape. 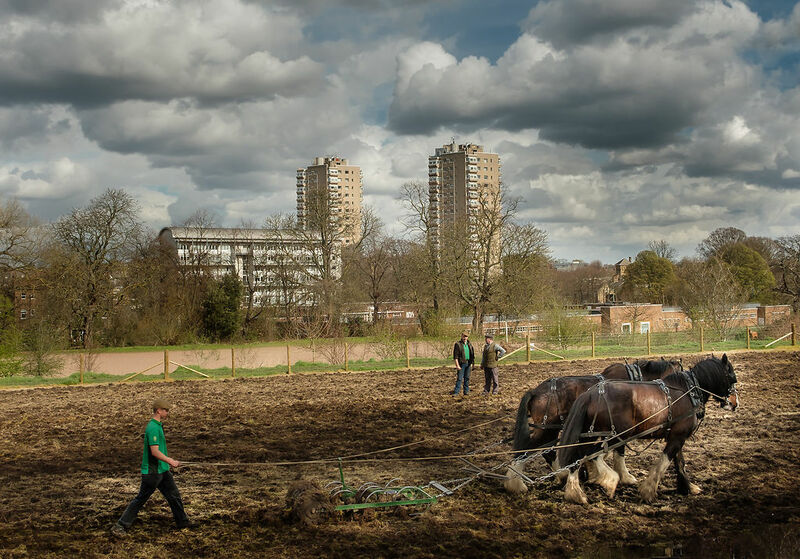 The horses belong to Operation Centaur and were breaking up ground that’s going to sown with wild flowers. This is pretty-well straight out of the camera – just cropped a little. Weak pun intended.